Learn how to organize your Workspace inbox. In Workspace, like most email applications, your inbox shows your email sorted by the date you received the message. You can control how you sort your inbox and display messages alphabetically by subject, messages with attachments first or sort messages alphabetically by sender. You can switch between these sorting options at any time. Go to the upper-right corner of the Inbox column, and then click the hyperlink. Select how you'd like to sort messages. 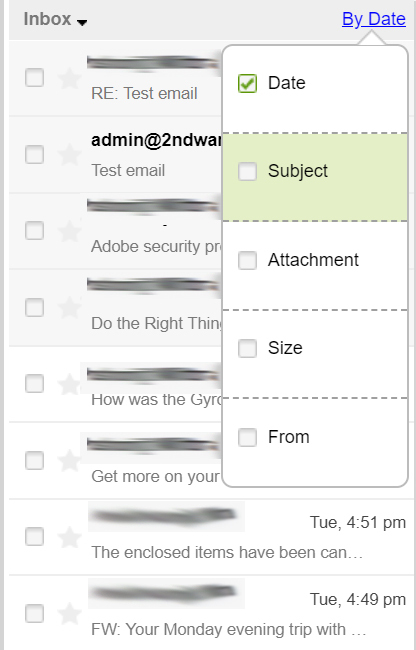 Go to the upper-right corner of the Inbox column, and hover over the arrow icon. On the header bar above your list of messages, click From, Subject, Date, or Size. Go to the header bar above your list of messages, and then click From, Subject, Date, or Size.